Obtain a thorough history. 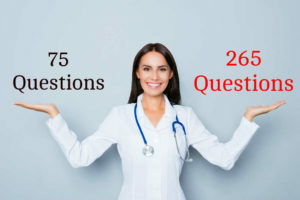 Ask if any of the patient’s close contacts have the same signs and symptoms. Implement contact precautions and maintain them for 24 hours after the start of effective therapy. Put on clean gloves and a gown. Remove and bag the patient’s clothing and help her put on a patient gown. Look for pimple-like irritations, burrows, or rash. 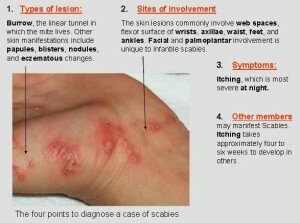 Assess affected areas for signs of secondary infection. Assist the healthcare provider when obtaining skin scrapings if ordered. Isolating the mites or their ova or feces in a skin scraping confirms the diagnosis. Teach the patient about the prescribed treatments and medications and how to prevent re-infestation. Close personal contacts should be treated at the same time. Teach them to wash all linens, towels, and clothing used by the patient during the 2 days before treatment in hot water and dry them in a hot dryer. Tell the patient to apply the prescribed scabicide cream or lotion to clean skin from her neck to her toes, including all skin folds, and to wash it off after 8 to 14 hours or as directed. Tell her a second application of the same cream or lotion may be necessary based on the response. 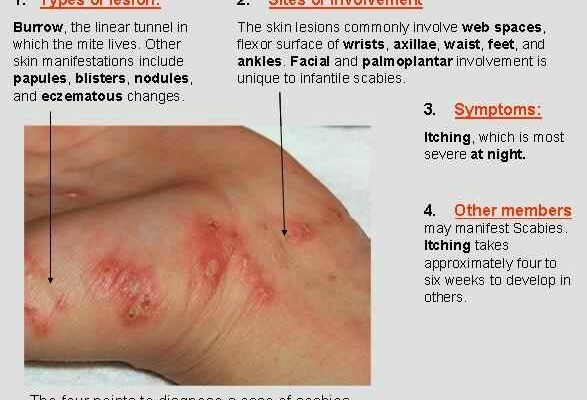 Teach her that itching may continue for 2 to 3 weeks, but it doesn’t mean that she’s still infested. But she should report severe itching to her healthcare provider, who may prescribe additional medication. Also teach her to notify the healthcare provider if lesions become red, draining, swelling, or painful. Tell her to keep her fingernails and toenails short because mites can hide under the nails. Tell her that no new rashes or burrows should appear after 48 hours and that she should be reexamined in 2 weeks. Maintain aseptic environment during the installation of equipment. Don’t let the patient use the prescribed scabicide on her face or near her eyes. Don’t let the patient attempt self-treatment with home remedies, such as gasoline, kerosene, or oils, because they may cause burns. 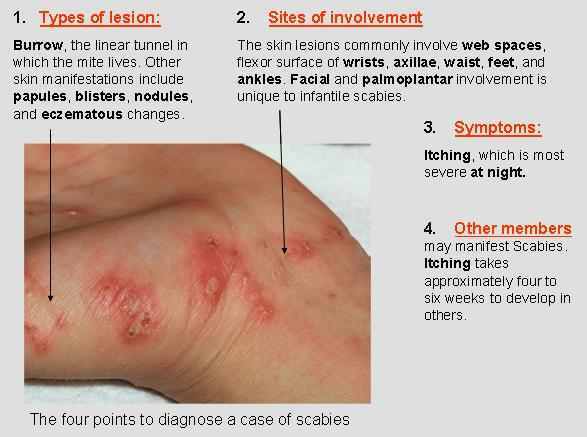 This entry was posted in Nursing Interventions and tagged nursing interventions for scabies, scabicide, scabicide cream, scabies. Bookmark the permalink.